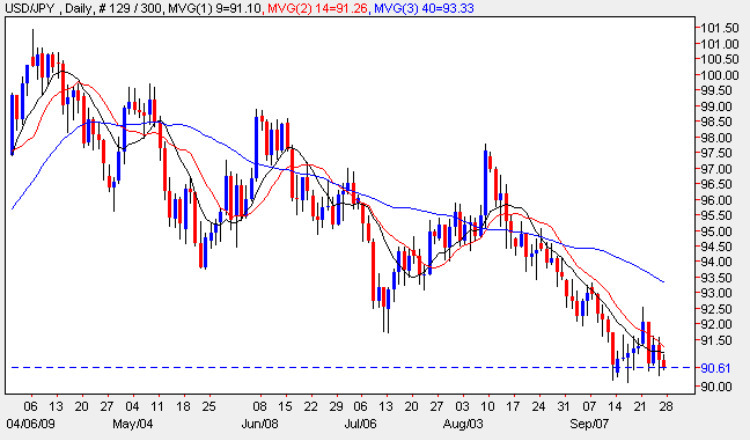 The yen to dollar pair continued to flirt with the 90.00 price handle once again yesterday, ending the trading session with a narrow spread down bar, but with a deep lower wick, suggesting once again that this price point is providing some support and preventing any deeper move lower at present. However, with Tuesday’s wide spread down bar providing a bearish signal, and with the close of yesterday ending below all three moving averages once again, this level may not hold for long, and we should see a continuation of the downwards trend in due course with our initial target for the move being 0.88 where a deeper support region awaits. There was little reaction overnight to the Bank of Japan minutes which were released in the Asian trading session, which were broadly in line with expectations, and therefore there was little movement from the Japanese yen as a result. All the other fundamental news on the economic calendar is in the US later today, and this is covered in more detail on the euro to dollar site.